Our 5-year-old grandson, Leeson, has a lot of sense. On Wednesday, I was watching the news on CBS at 7am. Quite some time was spent on divided families at the border. Leeson had just come downstairs and was playing with his toys close to the TV. At one point, a member of Congress described the President in most unflattering terms. Leeson immediately said I shouldn’t watch the news any more because all the people on it are always saying bad things. He asked that I switch to cartoons, which I did. The day immediately improved and continued to get better as I took him fishing in the afternoon, away from any “Breaking News” on my phone. In the evening, instead of watching “DW News” and the “BBC” on PBS (each offers a 25-minute international news summary), I went to the pub with a friend. Again, it was infinitely preferable to watching the news. The last few days has been quite depressing. Once again, I feel like I’m living through the last days of the Roman Empire. Rome, you will remember, was invaded by the “barbarians,” non-Romans who got into the empire and eventually took over. You would think we would have learned the lesson. But no, we haven’t. In the United States, approximately two-thirds of voters want the “barbarians” to come in and take over, although they wouldn’t express it in so many words. They basically want families breaking the law by illegally entering the country to be able to remain and stay together, receiving free education and health care at public expense, joining gangs, sending money back to their country of origin, etc., etc. It’s not just an American problem. Western European nations are also finding it impossible to stop the flood of immigrants from poorer parts of the world. The so-called “refugees” from the Middle East and Africa are mostly economic migrants, looking for more money and an easier life. Prior to World War II, this problem did not exist in the West. But after World War II, with the creation of welfare states, especially in western Europe, there has been a flood of people into western countries. An additional factor has been what is sometimes called “white guilt” over past “sins” (colonialism and slavery mostly). An article in the Wall Street Journal last Friday warned that Social Security and Medicare (almost free medical care for the elderly) will soon be broke. The only solution, claimed the writer, was more immigrants. Younger people would pay the taxes that would keep both programs growing. (“Social Security needs immigrants,” George Melloan, WSJ, 6/15). “The surge of retiring baby boomers is reshaping the U.S. into a country with fewer workers to support the elderly – a shift that will add to strains on retirement programs such as Social Security and sharpen the national debate on the role of immigration in the workforce. For most of the past few decades, the ratio of retiree-aged adults to those of working age barely budged. In 1980, there were 19 U.S. adults age 65 and over for every 100 Americans between 18 and 64, census figures show. That number barely edged up over the next 30 years. But there has been a rapid shift since then. By 2017, there were 25 Americans 65 and older for every 100 people in their working years, according to new census figures released Thursday that detail age and race for every county.” (Matt Murray, The Ten-Point). What is more logical is that, in order to grow the economy, there should be an end to abortion. This would give the US at least another million people a year, providing the young workers that are needed to fund social security and Medicare. How come the writer of the article never thought of this? What’s happening in the world is this – while people in the West severely limit the size of their families, people in poorer countries do not. Inevitably, the surplus people in less developed countries move to the richer nations. In Africa, people want to have lots of children to take care of them in old age; in the Middle East, the reasons may be different – the Palestinians want to outnumber the Israelis, for example, to overwhelm and overcome them in a future conflict. An additional factor is that many of the poorer countries in the world are “failed states,” with few economic opportunities and a great deal of political uncertainty and gang violence. People want to flee these bad situations, but their culture doesn’t change when they move to the West. Inner cities struggle with ethnic gang conflict. “The existential question, however, thus remains: How does the West, America included, stop the flood tide of migrants before it alters forever the political and demographic character of our nations and our civilization? (“Trump and the invasion of the west,” Pat Buchanan, 6/19). European attitudes toward migrants are changing. As I write, the future of German Chancellor Angela Merkel looks very uncertain, as her coalition falters over the issue of migrants; meanwhile, the new Italian government is refusing to accept any more refugees while committing itself to expel over half a million people, mostly from Africa; Austria has turned against refugees and seems set to join the Visegrad Group of four nations who share the same approach; the United Kingdom, which managed to preserve freedom of speech during England’s “darkest hour,” reacts to any bad news on migrants by limiting freedom of expression. 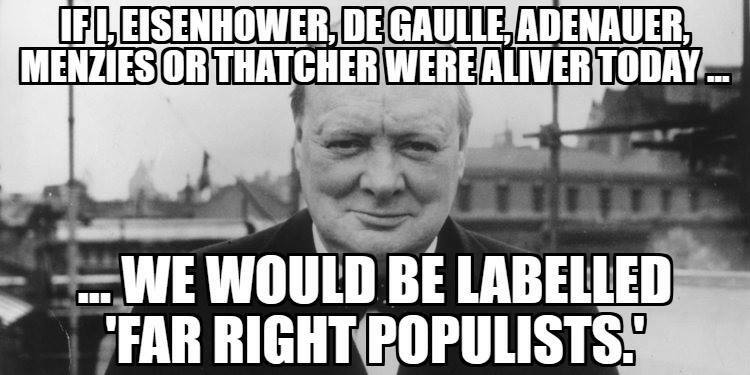 Populism and populists are on the rise. Of interest, all five countries are Catholic and a century ago, they were all partly or wholly in the Austro-Hungarian Empire. The migrant crisis is a major concern shared by these nations, all of whom want to preserve their Catholic and cultural heritage. Will the Kingdom of God be a multicultural paradise? Will political correctness be the law of the land? While the Bible tells us that “God shows no partiality” (Acts 10:34), we are also reminded in the same book that He created the nations and set their borders. Discrimination is wrong, but integration just isn’t going to work! Footnote: As I write, the local news is reporting that the “Asian and Hispanic” population in Michigan is rising, while the number of Caucasians is falling. The invasion continues. President Trump’s approval rating over North Korea is now at 55%, after what is perceived as a successful summit in Singapore. The Economist had a different view. It’s cover this week shows the two leaders meeting in front of the two flags, with the headline: “Kim Jong Won.” That wasn’t the only humor in the magazine, inspired by the summit. A cartoon on page 6 showed Kim Jong Un telling his military that if they cooperate with the US, President Trump will treat them like “close friends and allies,” at which point a collective groan of “Oh no,” goes up from them all. Allies of the US haven’t done too well lately. Little noticed by the press is that South Africa is moving toward the confiscation of white-owned farms, confiscation without compensation. It has even been suggested that all property owned by people of European descent should be seized by the state and redistributed. This has already been done, in neighboring Zimbabwe (formerly Rhodesia). The result was that millions of people starved to death, while the farms were simply un-used. Why should South Africa be any different? Nearly twenty years ago, the CDC released an ambitious proposal to “eliminate syphilis from the United States.” The plan seems to have worked rather poorly. Soon after the proposal’s issue, infection rates began to head in the wrong direction and then worsened. From 2000 until 2016, the most recent year for which data are available, the rates of syphilis quadrupled. Congenital syphilis, a nearly eradicated condition in which the infection is passed from mother to fetus, has also sharply increased – by nearly 28% from a low base in one year. That is distressing not only because the disease is easily detected and treated by course of antibiotics, but also because afflicted mothers have a 40% chance of a stillbirth. 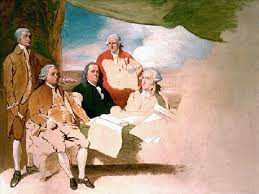 This 1783 portrait shows the American delegation to the Paris peace talks. The British refused to pose with the Americans. Animosity was still running high more than a year after the war had ended. With three young grandchildren in the house, including a baby that recently turned one year old, I’ve taken to watching silent movies on Turner Classic Movies (TCM). There’s no dialog to hear, so surrounding noise isn’t a problem. Recently, I watched “Love” with Greta Garbo and John Gilbert, made the following year. The two actors were more famous than Jennifer Lawrence and Leonardo DiCaprio are today. The movie was an enactment of Tolstoy’s “Anna Karenina.” The title was changed thanks to the tabloids. The gossip papers had revealed that, while making the film, Gilbert and Gabo had started their own relationship. This enabled the movie’s producers to put the following on marquees across America: “Garbo and Gilbert in Love.” The movie was a sensation, a bigger hit than anything Hollywood turns out nowadays. It wasn’t only the title that was changed. Producers chose to make the movie with two alternative endings. They referred to one as the “Russian ending,” with Anna, as in the classic, killing herself in front of a train after an adulterous affair that led to her losing her son. Another ending was made for Americans, with Anna’s husband dying, thereby leaving her free to marry her lover, Vronsky, and keep her son. It was felt that American audiences couldn’t handle Anna’s death. The “American” version missed the whole point of the novel. Interestingly, the Russian ending was shown in New York and on the West coast. It was only Mid-western sensibilities that they were concerned about. If Hollywood can’t even get a novel right, why would we expect them to be accurate when it comes to non-fiction? Another Russian “story” caused a problem for Hollywood a few years later, by which time sound had replaced the old silent movies. This movie dealt with “Rasputin and the Empress” (1932). It’s depiction of Prince Felix Yousoupov, the principal murderer of Rasputin, was so inaccurate it led to a major lawsuit; since then movies carry the words “all characters in this film are fictional,” or similar, to protect themselves from expensive lawsuits. Now, no attempt is made at accuracy. I’ve yet to see a Hollywood movie depict the American Revolution with any degree of accuracy. In Hollywood, everything has to be black and white. Real life is rarely like that. The Revolution was not Americans against the king; the country was equally divided — one third rebelled against the crown, one third were loyal and the other third couldn’t spell “crown.” On the eve of Yorktown, 40% were loyalists, with support for the Patriots down to 30%. Rather than the claim that the king was acting selfishly, it can be argued that the leaders of the Patriots were. They were heavily in debt to British banks, following a bad crop in 1773 – one way to get out from under the debt was to ditch the Crown. It’s not surprising that wealthy indebted landowners led the revolution – the only revolution in history where those rebelling were richer than those they rebelled against! This issue was finally resolved after the war when the belligerents got together in Paris. The Revolutionary War was a civil war. Most battles took place without the presence of British soldiers – brother fought brother, to death, with little mercy shown. Ironically, if the Revolutionary War had not taken place, the “Civil War” would never have happened – the imperial parliament in London abolished the slave trade in 1808 and slavery itself 25 years later. No battles were fought over the issue. Additionally, states’ rights would never have been a factor or cause for conflict. Canada was spared both civil wars. So, what did Americans gain? >>>American historian Gordon Wood, considered the foremost expert on the Revolution, wrote in his book: “The Radicalization of the American Revolution,” that England in the eighteenth century was the freest country in the world and that the colonists were even freer. The king was the guarantor of freedom – never again could a commoner like Oliver Cromwell take power and become a dictator. Celebrations for King George III’s coronation in 1762 were greater in the colonies than in England. So, what went wrong and why, then, did some Americans want more freedom? >>>The French and Indian Wars were fought by Britain and the colonists to defend the latter against a French Catholic take-over. George Washington, serving “King and Country”, fired the first shots. The seven-year war left the British government with serious debts, which they tried to recoup by taxing the colonies. Americans did not want to pay for the war. Over two centuries later, Americans still do not like to pay for wars. >>>Contrary to what is often thought today, all thirteen original colonies had a democratic form of government. All property-owning males could vote, with a 90% turnout at elections. After independence, there was no immediate widening of the franchise. In 1789, when the first election was held, only 6% of the population could vote. Both the United States and the United Kingdom extended the franchise during the nineteenth century and both gave women the vote after World War One. America lagged behind England in voting rights, not catching up until the Voting Rights Act of 1964. >>>The Right to Vote and the Right to Bear Arms were in force before 1776. Indeed, the revolution would not have been possible without these rights. >>>It has often been pointed out that the leaders of the Revolution were richer than the people they rebelled against. >>>In 1772, the monumental Somerset Decision sent shock-waves through the American colonies. A slave had taken his owner to court. The court ruled that nobody in the British Isles could be owned by somebody else. If extended to the colonies, this would have ruined prosperous farmers who needed free labor. >>>Rather than the claim that the king was acting selfishly, it can be argued that the leaders of the Patriots were. They were heavily in debt to British banks, following a bad crop in 1773. >>> Paul Revere did not ride through Lexington, Massachusetts, shouting: “the British are coming.” This would have made no sense as everybody was British. It would be like somebody today, seeing the police approaching, would shout out the warning that the Americans are coming. 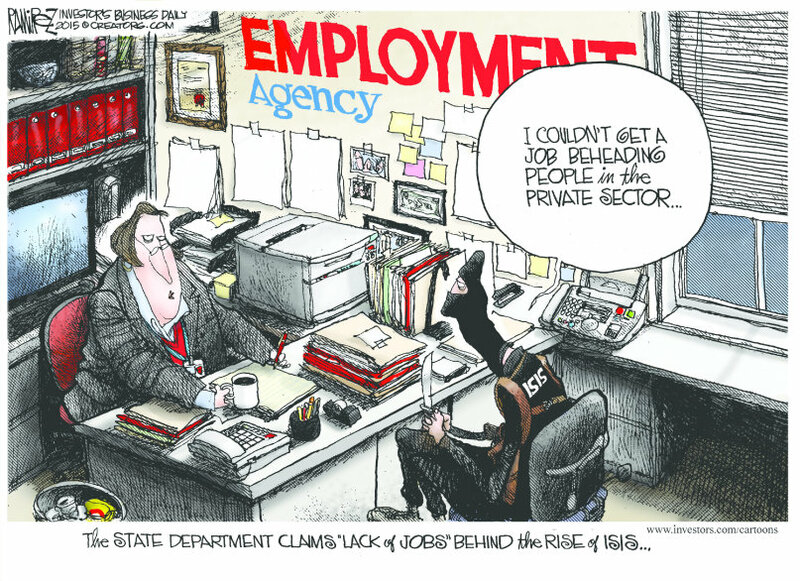 Rather, Paul Revere warned that “the Regulars are coming,” a reference to full time professional troops. >>>Geoffrey Wawro, a distinguished scholar of military history who teaches at the University of North Texas, led a discussion some years ago on “Global View” (History International Channel). The panel concluded that the separation of England and America weakened the English-speaking world considerably. >>>By 1800, almost twenty years after independence, Americans were paying more in taxes than they had ever paid under colonial rule. >>>As the Patriots called themselves the “Sons of Liberty,” the Tories referred to them as the “Sons of Anarchy.” Partly because of what happened a century earlier when England itself became a republic, many loyalists feared a total breakdown of law and order if the country became a republic, a country without a king. A Biblically literate population was aware of the warning at the end of the Book of Judges: “There was no king in Israel in those days; every man did that which was right in his own eyes.” (Judges 25:25). No king meant anarchy! >>>Many of today’s super-patriots, those who celebrate the 4th of July most vigorously, ironically, would probably have been Tories in 1780. Conservatives don’t like change or uncertainty. >>>This brings us back to the Russians. Newt Gingrich’s book “Yorktown” brings out that Catherine the Great of Russia offered to mediate between the British government and those rebelling against it. One idea proposed was that Americans would keep their unitary nation, but remain within the Empire. On the eve of the final Battle of Yorktown, this was acceptable to most Americans, including members of the Continental Congress. This would have resulted in America being more like Canada. It would, of course, also have meant there was no need for Canada – loyalists would have stayed where they were. Catherine’s mediation attempt got nowhere – the autocratic Russian Empress was hardly a credible mediator between two sides that both believed in democracy. >>>The victory at Yorktown would not have happened without the French navy. After the battle, the situation was unclear. It wasn’t until the King asked parliament for more money to fight the rebellion that the war finally ended – parliament refused his request. >>>Cut off from the empire’s trading system, the US struggled financially after independence. Even in the 1930’s, the nations of the British Empire recovered from the Great Depression quicker than the US. America was anxious to break into the imperial trading club without becoming a part of the empire. The question remains: what did Americans gain from independence? One thing comes immediately to mind – that the new country was no longer bound by British treaties with the “Indians;” they could now expand westward. Ironically, it was a British bank that financed the Louisiana Purchase and British investors who helped build the railways that opened up the West. So the Brits did their part to make the country expand anyway. On the other hand, if those treaties had remained in effect, California may never have entered the Union and Hollywood might not exist – some would say, those are two very good reasons for remaining loyal to the Crown! So, why did Americans revolt and why did the rebels (patriots) win? Decades after the American Revolution, the Anglo-Israelite movement believed that the British Empire and the United States of America were the fulfillment of a prophecy in Genesis 48; that the two sons of Joseph, Ephraim and Manasseh, would become a great company of nations (Ephraim; the British Empire and Commonwealth) and his brother would become a great single nation (Manasseh, the United States). As the “company of nations” (Genesis 48:19) was united by the Crown, the great single nation had to break away from the crown, which is exactly what the United States did. Note: ”He set Ephraim before Manasseh (verse 20)”. Britain was the world’s superpower before the United States. In relative terms, Britain was also greater than its successor. After the loss of the American colonies, the British went on to develop the greatest empire the world had ever seen. In other words, God determined the outcome of the Revolutionary War in order to fulfill Bible prophecy. When newspapers around the world reported that the Archduke Franz Ferdinand had been assassinated in Sarajevo, nobody would have thought it would lead to the First World War, the worst war in history. The subsequent war started in the Balkans, a part of Europe that frequently saw conflict; it didn’t seem anything to worry about. 25 years later, another world war followed on from the first, again started in Europe. You would think that, consequently, the world would want to know what’s happening in Europe! But the mention of Europe is likely to see wide-mouthed yawns in an audience – Europe is a continent of the past, not the future; a quaint place to visit but of no relevance. However, Europe is a continent that is unraveling as old rivalries rise to the surface. The end result could be a Europe that is very different from what we see now. What we are witnessing is the return of nationalism, the root cause of both world wars. Right now, we are in the dark, just as the world was the morning after the Archduke’s assassination. Another seemingly insignificant event could lead directly to global conflict, just as the assassination did over a century ago. After six decades of the European Union and its predecessor, Europeans are turning against the idea of “an ever closer union.” Now, they want to put their own country first. It started in the United Kingdom with the Brexit vote. Outside of Europe, the Americans voted earlier this month to put “America First.” Austrians seem likely to elect their “far right” candidate to the presidency on December 4th. If he wins, he has promised to dissolve parliament and to hold a vote on whether or not the country should stay in the EU. A referendum in Italy on the same day could also have a profound effect on other countries in Europe. However, the biggest two upcoming elections will be in France in May and Germany four months later. France just had its primaries for the center-right party, resulting in the selection of Francois Fillon as their presidential candidate. He will run against the leader of the Socialist Party. It’s not likely that their candidate will be the current socialist president, Francois Hollande, as his approval rating is down to only 4%. A third party candidate, Marine LePen, of the National Front, could beat the two establishment figures. Ms. LePen is against both the EU and immigration, two popular positions that could give her victory. Elections next year in France and Germany may see a continuation of the trend toward nationalist parties. Brexit has already led continental Europeans to move ahead with a European Army, independent of NATO. This has been talked about for some time, amid growing concerns about Russia and Islamic terrorism. Donald Trump’s victory in the US led, hours later, to a German call to quickly move forward – without Britain this is now possible. It’s also the case that, until the UK actually exits the EU, it will have to help pay for the combined military force. Europe and America differ on Russia, even more so now that Trump will be president. Note the following from The Orange County Register, November 25th. The editorial continues: “And the reality is that Putin is well on his way to getting it. NATO allies like Turkey, Bulgaria and Hungary have joined in a clear pendulum swing away from Western liberalism. At the same time, reactionary parties on the ascent aim to shake off the political bonds economically forged by the international institutions that give the US its influential stake in European affairs. Few in Europe wish to become satellites of Moscow. But few realize that, absent a robust American role in Europe, there is no European force powerful enough to keep its patchwork of small states from slipping into Russia’s shadow. “Were the US capable of defending a persuasive liberal agenda abroad, friendlier European relations toward Russia wouldn’t necessarily be cause for such profound alarm. But today, America’s leadership – like public opinion – is divided and unsure about just how much support free trade and international agreements deserve. Without clarity and confidence, even a little resurgence in traditionally pro-Russian sentiment in Europe could trigger a stampede away from the kind of American influence that has helped build and maintain security and order on the continent for generations. Europe is increasingly likely to break away from America; and Germany is the leader of Europe. But . . . not yet! Konrad Adenauer was Germany’s first chancellor after the formation of the Federal Republic in 1949, four years after Adolf Hitler. Germany’s foreign policy since then has been firmly rooted in both NATO and the EU. Extremist parties in the country threaten this and could destroy this policy after next year’s election. A different chancellor, a stronger chancellor, perhaps with more extremist views of either left or right, could make a huge difference in the 2017 general election. 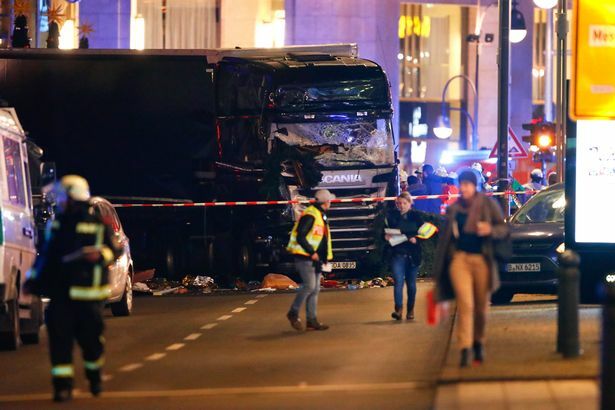 It’s very difficult to predict what will happen in the next twelve months in Germany or other European nations, but the continent is going through a peaceful turmoil that could see radical changes in the months ahead. The biblical books of Daniel and Revelation both wrote of the Roman Empire and successive attempts to revive the empire down through the ages. In 1922 Mussolini proclaimed a revived Roman Empire; in 1957, the Treaty of Rome was signed to lay the groundwork for another attempt at European Union. 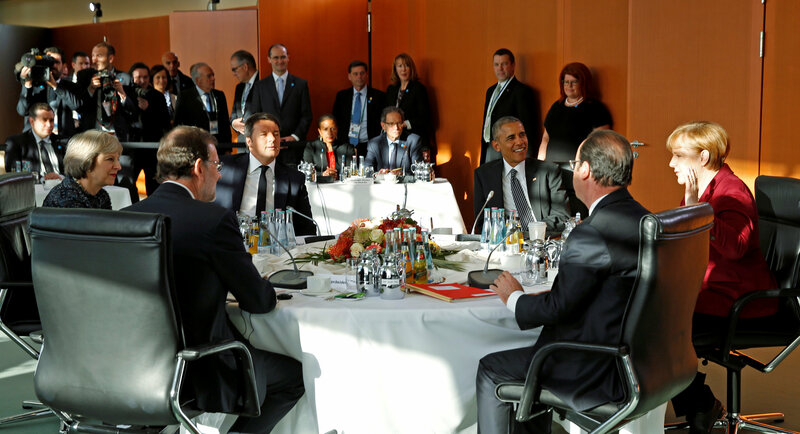 A final group of European nations will soon come together, with Germany as its leader. Bible students have expected this for years — now the world’s media sees Berlin as the new European capital and Germany as the driving force behind the world’s biggest single economic grouping. Does any reader have 60,000 frequent flyer miles they are not likely to use? I would like to go over to Europe to research and write on developments on the continent. The latest series of Downton Abbey is currently showing on PBS in the United States. The hit series is set in an English stately home. It started four years ago with the sinking of the Titanic in 1912. We have gone through World War One with the Grantham family and are now witnessing events in 1924, when the first Labour government came to power. Hopefully, the series can get us through to World War Two and its aftermath, before falling ratings finish it off. As I come from England, I’m often asked if the class system so accurately portrayed on the program still exists. The answer to that can be found at Highclere Castle, which is the real name of the fictional Downton Abbey. Whereas Downton is supposed to be in the county of Yorkshire in the North of England, it is actually filmed at Highclere Castle, which is west of London. It is the home of the Earl and Countess of Carnarvon. A documentary on Highclere Castle was shown some time ago on PBS. It showed the Earl and his wife are very normal people who are dedicated to preserving their ancestral home and its estate. High taxes were a major factor in the decline of the aristocracy, starting with the 1906 Liberal government. After World War II taxes on inherited wealth were so high that many aristocrats were forced to abandon their homes and property. The Duke and Duchess of Marlborough, owners of Blenheim Palace, Churchill’s birthplace, now live in the Caribbean; visitors can tour their home, ensuring its financial upkeep and giving the Marlboroughs enough to live on. What about all those servants? Downton’s plot lines involve those employed downstairs as much as Lord Grantham and his family. Sadly, all those butlers, footmen, ladies’ maids and cleaning staff are no longer likely to be there. Some may see this as progress. However, before World War One there were three million domestic servants in Britain – not so long ago, that number was down to 68,000, with three million unemployed! 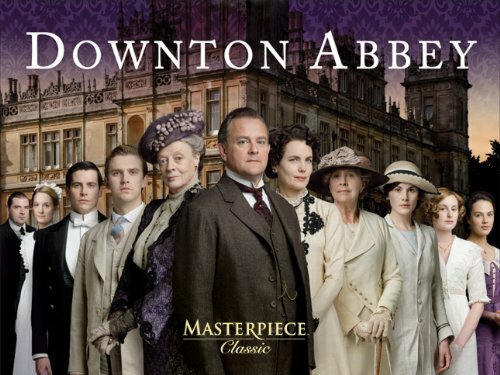 The documentary on the real Downton Abbey showed the present-day residents have just one butler, a really old gentleman who probably can’t handle all the hard physical work some of the younger staff did decades ago. What was apparent is that the three of them, both aristocrats and their servant, work together as a team to preserve the historic house and ensure its continuity for members of the public who wish to visit it. And for any television company that wants to hire it. So, does England still have a class system? Great Britain still has titles, but a title does not equate to wealth. That was true in the latter half of the nineteenth century when Britain was the wealthiest country in the world. Due to rapid industrialization and cheap food imports from its colonies, many aristocrats fell on hard times. At the same time, the US had created many multi-millionaires in the aftermath of the Civil War. Those millionaires often sent their daughters to England to find a titled aristocrat to marry. The American heiress gained a title and the English husband was solvent again! Winston Churchill was the product of the most famous marriage between a wealthy American and an aristocratic Englishman. The question asked – if England still has a class system – belies a simple reality. That reality is that all nations have an aristocracy. The difference in Great Britain is that British aristocrats tend to have titles. Not all do. The wealthiest people in Britain today are not likely to be aristocrats, so much as oil sheikhs from the Middle East, Russian businessmen hiding from Vladimir Putin, rock stars, football players and, leading them all, J.K. Rowling, the wealthiest woman in the country, once a struggling single mother who could not buy more than one coffee at the local equivalent of Starbucks, until, that is, Harry Potter came along. For years, Madonna came in at number two. 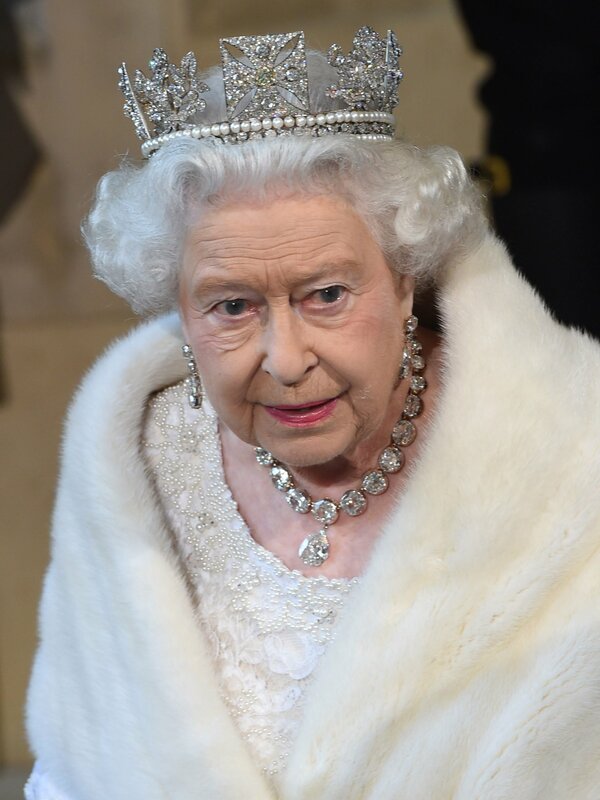 The Queen is not even in the top 500 wealthiest people in the country. Today’s aristocracy is just as likely to be found in the United States as in Britain. The Economist cover story on January 24th highlighted “America’s new aristocracy.” An accompanying article showed that education is behind today’s inheritance of privilege. Educated couples typically earn the most. They then ensure their children get the best education so they, in turn, are at the top of society. So an inherited, but untitled, aristocracy continues from generation to generation. They may not have all the servants the Granthams had in Downton Abbey, but then nobody does today. Although I’m sure there are good servants still around, I doubt there are many left like Mr. Carson, Mrs. Hughes and even the old gentleman at Highclere Castle. Being “in service” is no longer considered a calling – the great-grandchildren of the Granthams’ servants are far more likely to be enjoying life on the dole!